Established in 1970, this gallery is one of the most dynamic visual arts spaces in downtown Atlanta. The gallery presents exhibits featuring works by local, regional, national and international artists, as well as Georgia State students, faculty and alumni. Parking: Paid parking is available in the United Way parking garage at Courtland Avenue and Edgewood Avenue. Parking in the garage is free after 5 p.m. MARTA: Take MARTA to the Five Points Station. Out of the station walk southeast on Alabama Street, and turn left on Peachtree Street. Turn right on Edgewood Avenue, and make a right on Peachtree Center Avenue. 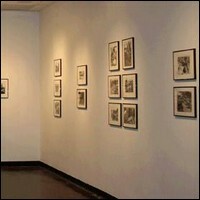 The gallery is located in the Art & Humanities building.